Freelance Web developer is a self-employed expert, who is responsible for coding and designing innovative websites. Normally their task of website development starts right from the home page to website functionally and site layouts. 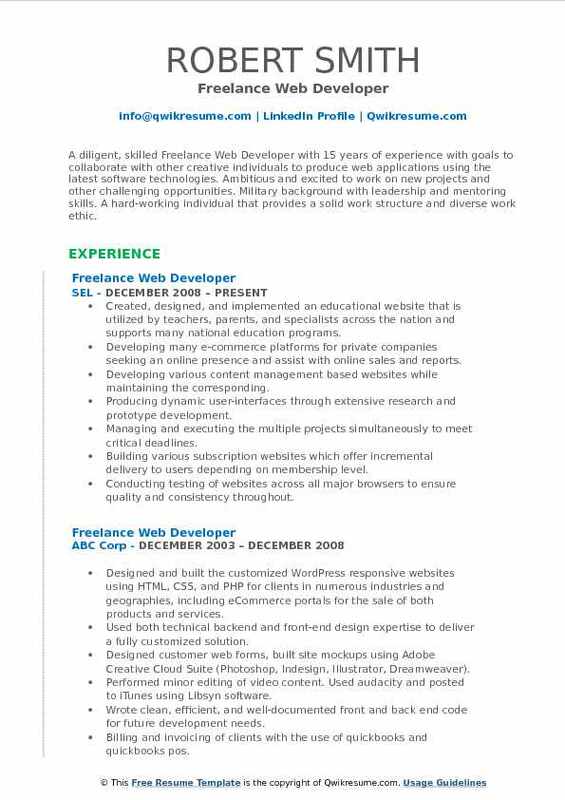 Some of the specific job responsibilities that are taken up by these developers include writing a well designed testable code, creating website layout or interface using HTML or CSS, integrating data from back-end services, creating and maintaining software documentation, maintaining, expanding, scaling and modifying the website, collaborating with other web designers for matching visual designing intent. Handling all verbal and written communications between hosting companies, clients, and vendors. Meeting with the prospective clients to review website, and gather the client’s specifications for new or existing websites. Designing and implementing the front-end using HTML5, CSS3, jQuery, AngularJS, Grunt. Built custom websites using Bootstrap and WordPress, including custom plug-ins and filters. Preparing multiple designs and wireframes for clients approval before proceeding with development. 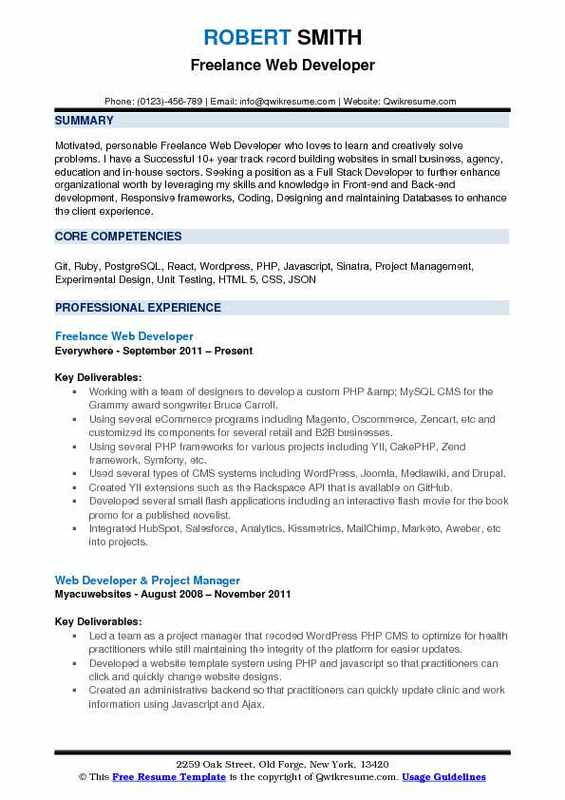 Summary : Motivated, personable Freelance Web Developer who loves to learn and creatively solve problems. I have a Successful 10+ year track record building websites in small business, agency, education and in-house sectors. 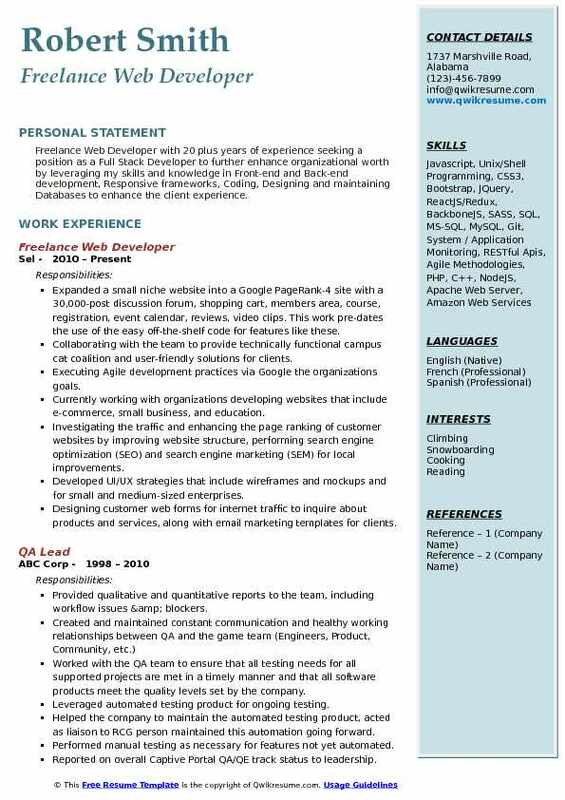 Seeking a position as a Full Stack Developer to further enhance organizational worth by leveraging my skills and knowledge in Front-end and Back-end development, Responsive frameworks, Coding, Designing and maintaining Databases to enhance the client experience. Working with a team of designers to develop a custom PHP & MySQL CMS for the Grammy award songwriter Bruce Carroll. Using several eCommerce programs including Magento, Oscommerce, Zencart, etc and customized its components for several retail and B2B businesses. Using several PHP frameworks for various projects including YII, CakePHP, Zend framework, Symfony, etc. Used several types of CMS systems including WordPress, Joomla, Mediawiki, and Drupal. Created YII extensions such as the Rackspace API that is available on GitHub. Developed several small flash applications including an interactive flash movie for the book promo for a published novelist. Integrated HubSpot, Salesforce, Analytics, Kissmetrics, MailChimp, Marketo, Aweber, etc into projects. Managing Linux servers using shell access for freelance and client websites. Developing many customs made WordPress themes & plugins for clients in different sectors. Summary : Highly skilled Freelance Web Developer with 13 years of experience, with a passion for solving complex business problems. Excels at the client and internal-user interaction with demonstrated ability to translate business requirements into technical requirements and back again as required. Tracks record for transforming requirements into tangible solutions that meet or exceed expectations. Skills : C#, PHP, T-SQL, SQL, XML, Java, Codeigniter, Laravel, Mono, MSSQL Server 2000/2005, Visual Studio 2003/2005/2008, .NET 1.1/2.0/3.0/3.5/4.0, Windows 3.1, Windows 7, Linux, Apache2, Object Oriented Programming, Android. Developing and maintaining the website back-end functionality for many different clients located in various states across the country. Utilized “lamp” software stack (Linux, Apache, MySQL, and PHP) with some light Ajax use to enhance site usability. Creating websites from scratch using PHP, some on top of the Codeigniter PHP framework (www. codeigniter.com) or Laravel framework (www.laravel.com). Designed and implemented MySQL databases to support the websites created. Created “squealer” app for Android devices and sold it to google play store (april-may 2012). Created from scratch, the database-driven website on top of a lamp stack using PHP and the Codeigniter framework. the design was provided and integrated into the website backend to look and function according to client specifications. Took over the existing site to complete work started by another developer. Based on lamp stack using php and codeigniter framework. Worked on numerous enhancements since initial project completed. Took over a project which was 85% complete after the original developer abandoned the project. Built on lamp using PHP and codeigniter framework. Completed requested work and have enhanced the site many times at the clients request. Summary : A diligent, skilled Freelance Web Developer with 15 years of experience with goals to collaborate with other creative individuals to produce web applications using the latest software technologies. Ambitious and excited to work on new projects and other challenging opportunities. Military background with leadership and mentoring skills. A hard-working individual that provides a solid work structure and diverse work ethic. Created, designed, and implemented an educational website that is utilized by teachers, parents, and specialists across the nation and supports many national education programs. Developing many e-commerce platforms for private companies seeking an online presence and assist with online sales and reports. Developing various content management based websites while maintaining the corresponding. Producing dynamic user-interfaces through extensive research and prototype development. Managing and executing the multiple projects simultaneously to meet critical deadlines. Building various subscription websites which offer incremental delivery to users depending on membership level. Conducting testing of websites across all major browsers to ensure quality and consistency throughout. Created a homework management system for a private school that individual teachers could update and schedule with a calendar. 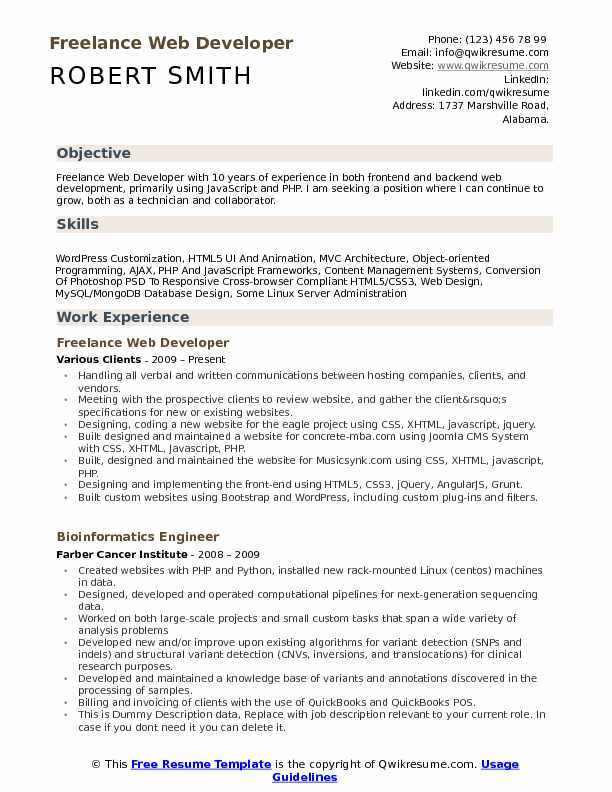 Summary : Freelance Web Developer with 20 plus years of experience seeking a position as a Full Stack Developer to further enhance organizational worth by leveraging my skills and knowledge in Front-end and Back-end development, Responsive frameworks, Coding, Designing and maintaining Databases to enhance the client experience. Expanded a small niche website into a Google PageRank-4 site with a 30,000-post discussion forum, shopping cart, members area, course, registration, event calendar, reviews, video clips. This work pre-dates the use of the easy off-the-shelf code for features like these. Collaborating with the team to provide technically functional campus cat coalition and user-friendly solutions for clients. Executing Agile development practices via Google the organization's goals. Currently working with organizations developing websites that include e-commerce, small business, and education. Investigating the traffic and enhancing the page ranking of customer websites by improving website structure, performing search engine optimization (SEO) and search engine marketing (SEM) for local improvements. Developed UI/UX strategies that include wireframes and mockups and for small and medium-sized enterprises. Designing customer web forms for internet traffic to inquire about products and services, along with email marketing templates for clients. Building and managing the branded social media accounts for Facebook, Twitter, LinkedIn, and Google Plus, driving a consistent increase in traffic across all platforms. Applied extensive search engine optimization principles and social media to outrank competition on Google and other search engines across a variety of keywords that drive traffic to produce profits. Designing and implementing the process management system using PHP, jQuery, and MySQL. Implement ux focused, fluid responsive websites and build out web presences. Evaluating the potential software products based on new and existing system development and migration. 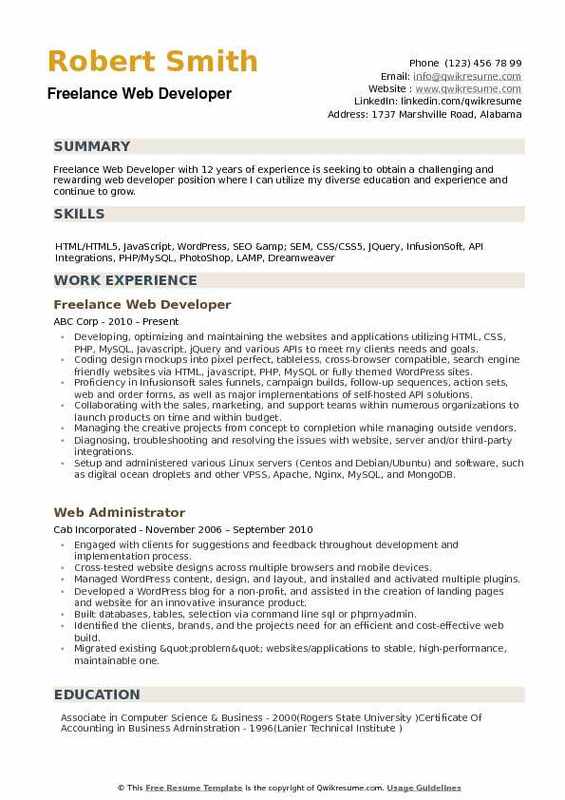 Headline : Freelance Web Developer with six-plus years of experience developing, implementing and supporting websites for commercial and non-commercial clients. 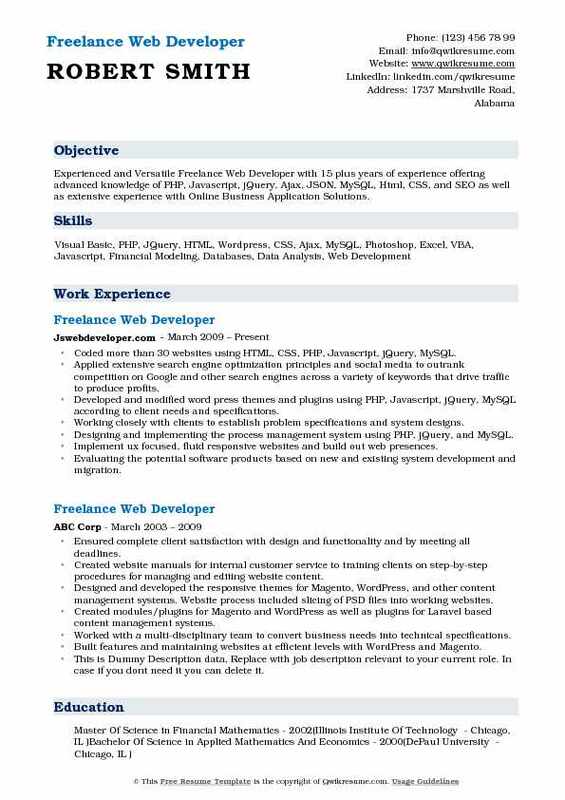 Strong experience with multiple programming languages required for website, web application and database development. Enjoy working as a team member, excellent communication, and interpersonal skills, self-motivated and proactive. Quick learner, strong reasoning, and problem-solving skills. Designed and developed a small business website for a local artist in Miami. Through the use of this website as an online portfolio, the client has been able to sell artwork in markets that would otherwise not be accessible. Developing a personal blogging website for an individual utilizing the WordPress platform. Through the use of WordPress, the client is able to frequently make updates to the site without any knowledge of code or web development practices. This website was designed and developed for a small event coordination firm specializing in weddings. The website is comprised of flash technology using ActionScript 3.0, HTML4 & CSS2. Communicates and provides feedback to clients needs and requirements. Installed and configured centos or debian, apache or httpd, mysql or mariadb, and php. 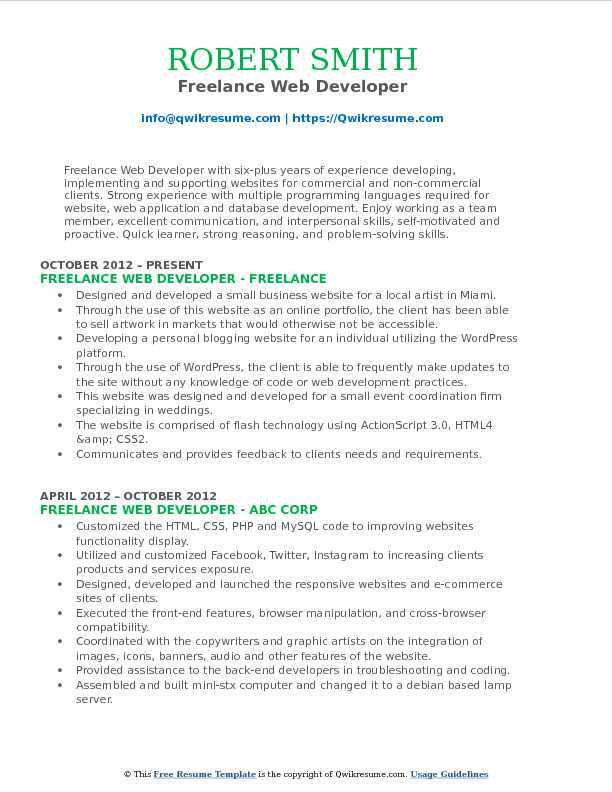 Summary : Freelance Web Developer with 7 years of experience and over two years of specialized education. I create and design interfaces, logos, and websites for a wide range of niches. My primary skills are in WordPress development with additional Ruby & Rails development. Developing an eCommerce website, membership website, and photography website using PHP, CSS, and MySQL on the WordPress platform. Websites were built locally on apache server then later migrated to live hosting using fire ftp. Creating and maintaining the databases using PHPMyAdmin as well as extracting and loading the test data on a regular basis for testing purposes. Cpanel provided through web hosting is utilized to manage server and websites. Developed a blog application with comment functionality using Ruby, CSS, and Sqlite3 database on the Rails framework. The application was built using the Aptana development environment and from there all updated source code were tracked and managed on GitHub. Responsible for writing all routes, controllers, models, views, and installing gems needed for functionality. Well versed in wordpress and drupal, many of my client sites were built as custom wordpress and drupal sites (theming, php development, database management) due to its easy to use interface and ability to allow them to quickly maintain their own content. Summary : Results-driven ABC Corp with 16 years of experience in back-end programming, relational databases and development/maintenance of complex and critical systems. Developer well-versed in structuring, developing and implementing interactive websites. 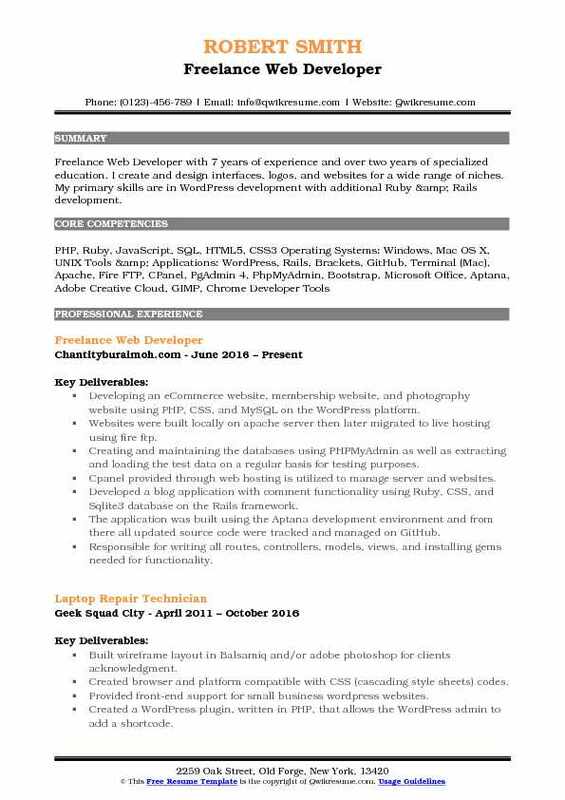 Technical Skills HTML, Apache, CSS, PHP, JS, MySQL, Python, FTP, Windows Linux. 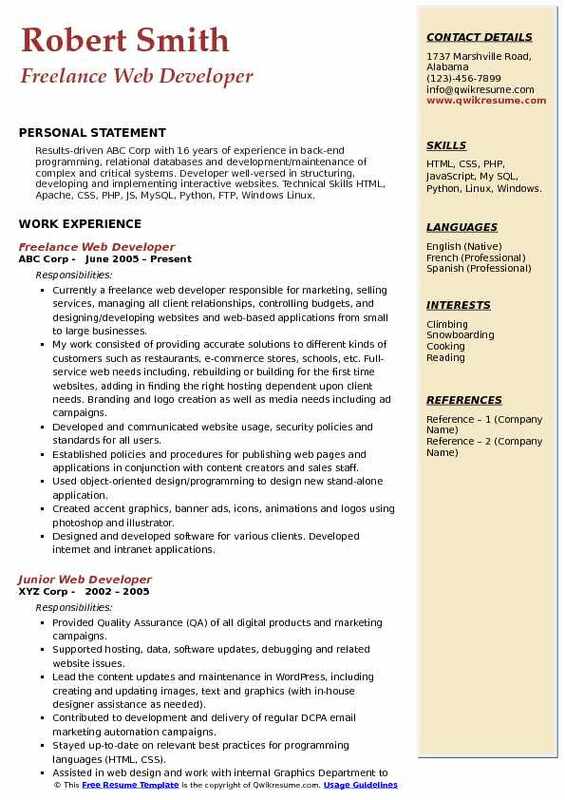 Currently a freelance web developer responsible for marketing, selling services, managing all client relationships, controlling budgets, and designing/developing websites and web-based applications from small to large businesses. My work consisted of providing accurate solutions to different kinds of customers such as restaurants, e-commerce stores, schools, etc. Full-service web needs including, rebuilding or building for the first time websites, adding in finding the right hosting dependent upon client needs. Branding and logo creation as well as media needs including ad campaigns. Developed and communicated website usage, security policies and standards for all users. Used object-oriented design/programming to design new stand-alone application. Created accent graphics, banner ads, icons, animations and logos using photoshop and illustrator. Designed and developed software for various clients. Developed internet and intranet applications. Built client sites using WordPress and PHP based content management systems. 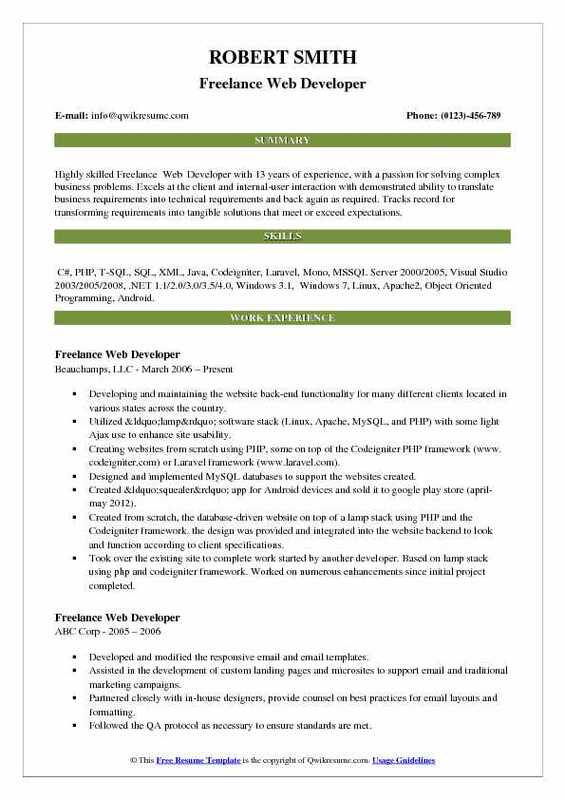 Summary : Freelance Web Developer with 12 years of experience is seeking to obtain a challenging and rewarding web developer position where I can utilize my diverse education and experience and continue to grow. Proficiency in Infusionsoft sales funnels, campaign builds, follow-up sequences, action sets, web and order forms, as well as major implementations of self-hosted API solutions. Collaborating with the sales, marketing, and support teams within numerous organizations to launch products on time and within budget. Managing the creative projects from concept to completion while managing outside vendors. Diagnosing, troubleshooting and resolving the issues with website, server and/or third-party integrations. Setup and administered various Linux servers (Centos and Debian/Ubuntu) and software, such as digital ocean droplets and other VPSS, Apache, Nginx, MySQL, and MongoDB.